This is the first time I got to hear some violin-like sounds come out of this wooden box that I’ve been working on for almost a year now. This is an Amati model, the second violin I started at school, but it got set-up first. Still got a few things to fix on it before I can really call it done. My first violin should be done in the next month, and my viola soon after. I’ll do a proper photo shoot with the newborn soon. 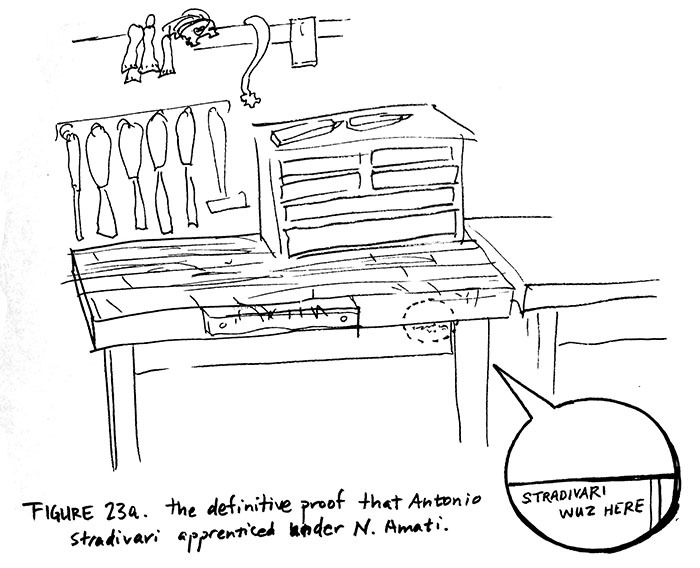 We are required to read a century-old biography on Antonio Stradivari. It’s apparently full of inaccuracies. The book says Strad was a student of Nicolo Amati, but my teacher says the general consensus now is that Strad didn’t work under Amati. Whatever. I’m sure I’ve lost your attention by now. The point is, don’t believe the comic… as if you were going to anyway.